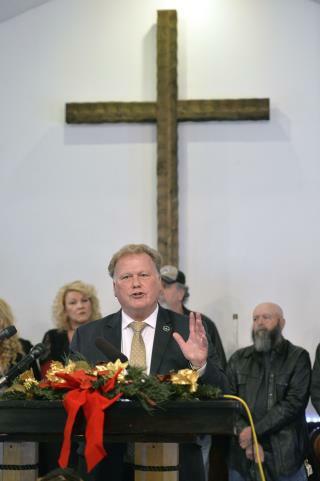 (Newser) – "Dan is gone, but his story is far from over," says the widow of Dan Johnson, a Kentucky state lawmaker who killed himself Wednesday night after he was accused of sexually assaulting a teenage girl. Rebecca Johnson says she plans to run for the Republican's House seat because "these high-tech lynchings based on lies and half-truths can't be allowed to win the day," the Louisville Courier Journal reports. A special election for the seat is expected in February. Authorities say the 57-year-old lawmaker shot himself in the head at a bridge in a remote area after leaving a Facebook post denying the accusation and saying "HEAVEN IS MY HOME," reports the New York Daily News. Good luck, hon. Not a chance in he*l you will win. At the very least, this guy showed he had some semblance of a conscience. Unlike all the other sexual predators, he didnt continue his run for office or try to disappear until he can make a comeback and rehabilitate his image. Classic "Stand By Your Man" even if he's a liar, molester and SCUMBAG! She's just as much of a loser.